The CPO program was created by the IFPO to provide "current, useful, consolidated security training that provides vital 'need to know' information for Protection Officers throughout the Security Industry." The Certified Protection Officer (CPO) Final Challenge is an option which, for US$100.00, would allow you to receive the same designation as an individual who completed the CPO program under the regular course of study. 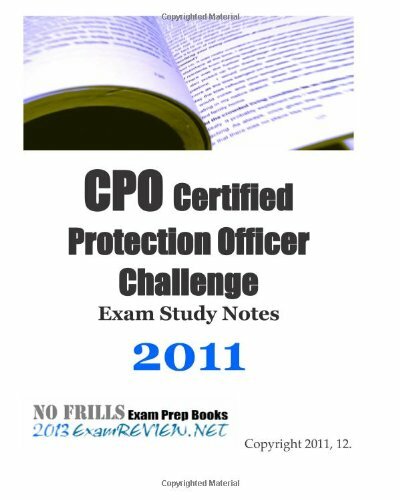 The CPO Final Challenge option would reduce the time of study required since the only required examination involved in this program would be that of the CPO Final Examination. The CPO Program Final Examination consists of 328 true/false and multiple choice questions, with a four (4) hour time limit. It has a coverage which is highly extensive - in fact so extensive that I wouldn't recommend taking the exam until you are fully drilled on the relevant topics. Many CPO candidates are experienced professional who have been in the field of security for years, that they know most of the practical how-tos, and all they need is to learn the principles, concepts and science that are behind the essential security techniques. Going through all the reference material officially listed would be quite overwhelming for these busy professionals. ExamFOCUS Study Notes build a solid focus while revisiting key examination topics. Whether you are just starting to study, cramming at the last minute, or simply looking to refresh, this could prove to be a lifesaver! To succeed in the exam you need to get yourself truly familiar with the most important information by going through sufficiently focused revision. This is where we fill the gap - you may think of our product as the unofficial supplement to the regular training class, or you may view it as a standalone module with a focus on building up your exam readiness. As an effective learning aid implemented in the format of study notes, the ExamFOCUS CPO Study Notes package is designed to present information in an easy-to-understand, conversational format. Notes are well-written, technically accurate and completely representative of the key information covered by the exam. Our original research into the majority of certification exams reveals specific weaknesses never before discovered that you can exploit to increase your exam performance more than you've ever imagined- and it's all available for less than the retail price of the rest of the filler-packed examprep products on the market.